Making bespoke furniture means that you have the benefit of creating something truly different when required and sometimes it can take the form of some very non-standard curved cabinetry. The world of kitchen design appears to have become fairly angular in the last decade, but that’s certainly not to say that there isn’t a great case to still accommodate a curve or two and it can be as subtle or blatant as the client wishes. With this kitchen (Hampton), we wanted to demonstrate how well a curved, almost organically shaped kitchen island could sit with our Hampton design. Crisply painted white, the main kitchen almost gives the feel of a pristine, un-touched wedding cake which is why it just felt right to create the curved island in a warm oak! We wanted to have the effect of people being drawn to and admiring the main kitchen whilst running their hands around the sweeping curves of the island. The honed marble edges are incredibly soft and smooth to the touch and tactility is something that’s incredibly important in the kitchen. 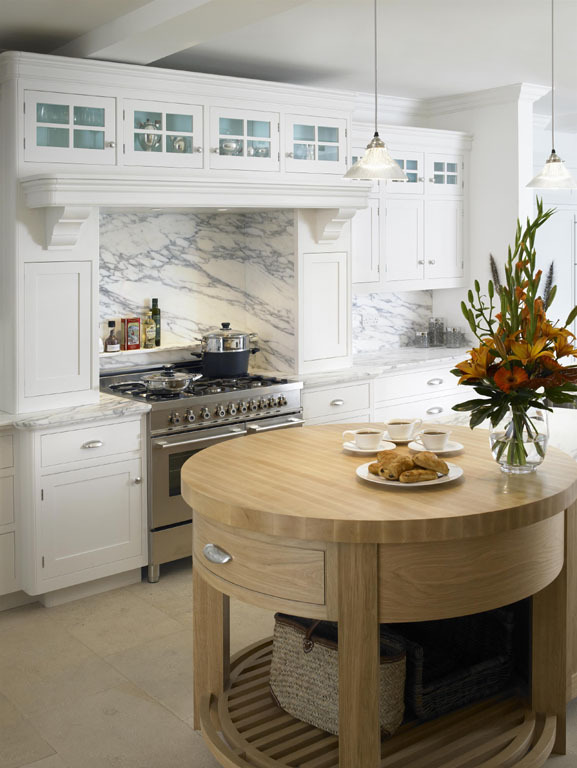 Create a curved feature and add a sumptuous marble and almost everybody that stands at the kitchen island will explore the sweeping curves with their hands whilst taking in the straight lines of the perimeter furniture. Ultimately it just creates a much warmer feeling, enhanced by the oak timber. There’s always going to be an admiration for a beautiful natural timber such as the oak, which only gets better over time when the colour mellows. We could have taken the easier option and fitted a rectangular island with a beautiful marble top and that’s not to say it wouldn’t have gleaned admiration in its own right, but that would have missed the point here. 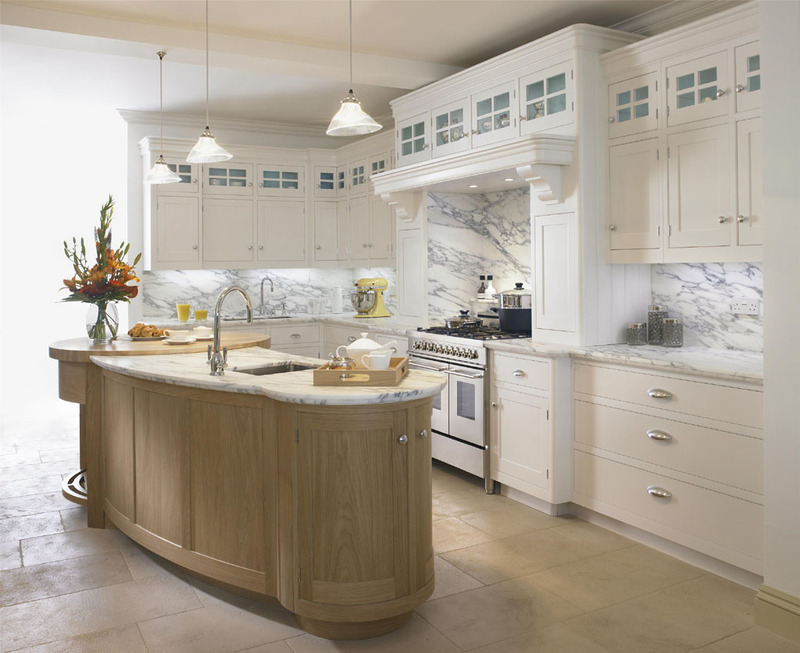 We wanted to simply demonstrate that a beautifully crafted traditional kitchen could feel warm and inviting with the addition of natural wood and flowing curves. The kitchen island in this case is almost the extreme, but there are other, more subtle ways of softening the look, which could include curving an island worktop but keeping the main units underneath square. Another favourite in terms of look and tactility is to employ subtle radius’s throughout the kitchen. Rather than a square edge, a cabinet side can have a small curved section with this being echoed on the worktop above it. The resulting softened edge can be pleasing on the eye as well as being more child friendly, with little heads only coming in to contact with a smooth curve rather than a hard angle when the obligatory chase around the island results in a bump and a few tears! I also think that small spaces can sometimes benefit from a mix of curves and straight lines, for example, a curved wooden peninsular breakfast bar in a confined space can feel far more tactile and inviting and certainly more forgiving to walk in to, especially if a number of people are trying to use the kitchen at the same time. The key thing here is to be receptive to all options at the design stage. There’s certainly no harm in letting us sketch some curves for you in the kitchen design, and it may just be that you end up with some wonderful features that you would have never considered before! For further help and advice when it comes to looking at your kitchen project, why not arrange a design consultation with myself, Andy Barette, at our Chelsea showroom. Feel free to email me at ab@mccarronandco.com as I would be delighted to help.